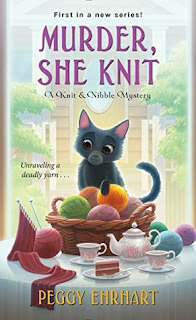 Murder, She Knit is book 1 in A Knit & Nibble Mystery series. I've really been in a cozy mystery mood lately so I've been trying out different ones. When I saw that this had a strong knitting element I had to grab it from the library. I've been knitting as a hobby for the past year so this was a nice change of pace and it had a good whodunit I couldn't guess! Our story starts out with Pamela Paterson hosting a Knit and Nibble meeting at her house. She invited an old friend that was new to the area to the meeting but she never showed. Unfortunately for everyone the girl winds up being found murdered with a knitting needle. Pamela and her friend Bettina want to figure out who was behind this terrible act since everyone at the meeting is in question plus quite a few others so they're determined to unravel the mystery. We go on quite a journey and through several suspects while getting to know Pamela and her knitting group and it really made for an entertaining read. I am happy to report I didn't guess who the killer was, and when revealed the little clues clicked in place. Murder, She Knit is a great start to a cozy mystery series. I enjoyed getting to know Pamela, she's a sweetie that takes care of a stray kitty and loves to knit, she's a lady after my heart. I can't wait to see what trouble occurs in the next installment. I'd recommend this book if you like cozy mystery novels and being crafty.